Channel your inner princess in this bold dress 60266 from Alyce Paris. This gorgeous gown features a fitted bodice with a V-cut neckline and a low back. A thick band cinches your waist before flowing out into a flattering A-line skirt. 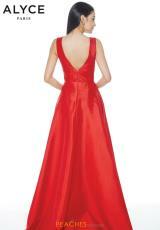 The stretch taffeta material shimmers as you move around, giving a regal flare to this simple and elegant silhouette.